A dying sunflower star afflicted with sea star wasting disease. The skin lesions are the first sign that something is wrong. Then limbs fall off and the body disintegrates, collapsing in on itself as it liquefies. In the end, what was once a sea star is only a puddle on the ocean floor. Since 2013, sea star wasting disease has killed so many starfish along the Pacific Coast that scientists say it's the largest disease epidemic ever observed in wild marine animals. Where there used to be dozens of stars, scuba divers now report seeing none. And while the epidemic itself is a naturally occurring (if particularly devastating) phenomenon, newly published research suggests that climate change may have exacerbated the disease's deadliness. "What we think is that the warm water anomalies made these starfish more susceptible to the disease that was already out there," says Joe Gaydos, the science director at the University of California, Davis' SeaDoc Society and one author of a study out today in the journal Science Advances. He and co-authors analyzed data collected by scuba divers and found that divers were less likely to see living sea stars when the water temperatures were abnormally high. "To think that warmer water temperature itself can cause animals to get disease quicker, or make them more susceptible, it's kind of a like a one-two punch," Gaydos says. "It's a little nerve-wracking." Worldwide, sea surface temperatures have been steadily rising as the Earth warms due to human-caused climate change. The study did not examine why warmer water might make sea stars more susceptible to disease. The authors hypothesize that the animals' relatively simple immune systems might be weaker when sea stars get hot. And the same scuba diver survey data also confirm a previous finding: that the mass die-off of sea stars is triggering a cascade of other ecosystem changes. The sea urchins that starfish usually eat are proliferating with abandon. Whole rocks that were once covered in sea stars are now covered in urchins. "We see these big urchin barrens where the urchins have gone through and eaten all the kelp," Gaydos says. Kelp forests, like tree forests, are a place lots of different species to live and feed. "We have higher biodiversity when we have more kelp. So it's setting off a cascade," he adds. "If you looked on land, it would almost be akin to clear-cutting a forest." 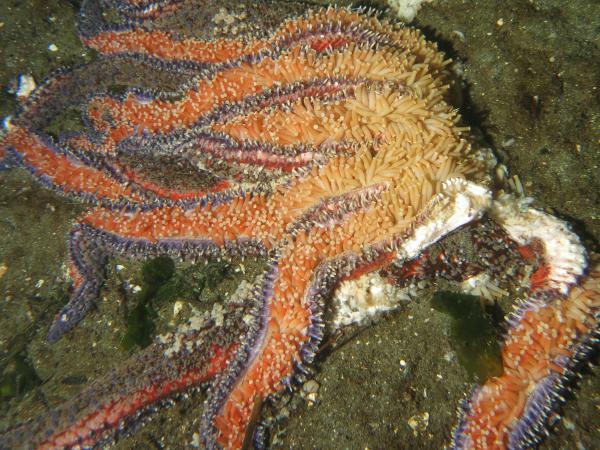 It's unclear whether sea star populations will recover en mass in the coming years. Research published last year suggested that some sea stars might be capable of surviving the disease, offering hope that the animals will bounce back over time.